-SG- It is generally thought that works Nortons started using the 8" Enfield front brake with the machines used for the 1926 season. However, it seems, from a recent 1925 Ulster photo appearing in Classic Motorcycle (inconveniently spread over two pages - how annoying I find that and so easily remedied!) - that the late '25 Works bikes were also fitted with this brake. That it is not perhaps the best brake of its time is open to discussion but I guess it was a good deal better than the puny 6" affair used on the works bikes earlier in the '25 season. 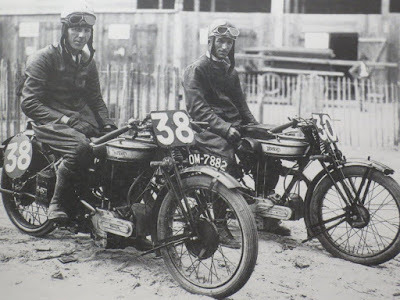 By chance I was sent a photo (above) a few years back showing a pair of 1925 works bikes, with Bennett and Craig aboard. It was perhaps at an event in France although Bennett's bike has no registration number plate on it and I am told this was compulsory for road racing events in France held on public roads. Be that as it may, it shows very clearly that Craig's bike has the 8 inch brake while Bennett's has the special 6 inch version, with leading brake arm, not seen on production Nortons of the period. PS; Thanks to Roger, who has been in touch about this posting. He tells me the photo was taken at Montlhery (the outside of the banking is in the background.) He goes on to advise that road number plates were not needed for events at Montlhery as the circuit was, of course, not a public road.